“Parmesan” is the American name for parmesan cheeses that imitate the original Italian parmesan cheeses. 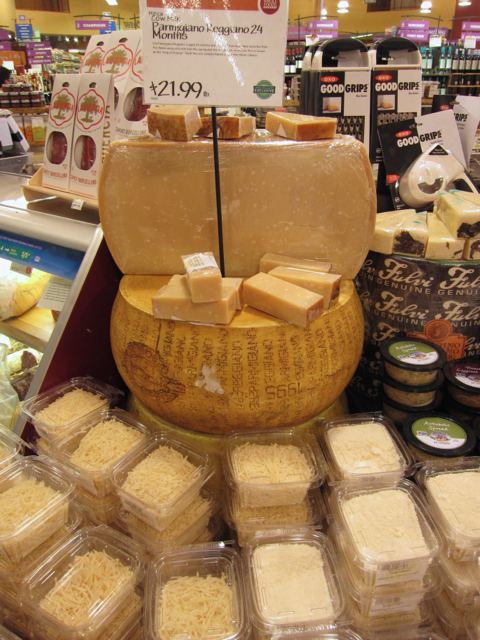 Even the cheeses from Italy will be labeled “parmesan.” But what you want for Italian dishes is going to be called parmesan reggiano or parmigiano reggiano. These cheeses have been aged for 24 months and are harder and have the wonderful sharp taste that is so great for lasagna, spaghetti and other pasta dishes and chicken parmigiana,. The parmesan cheeses that have been aged 6 months are sweeter. You eat this cheese as an appetizer or sprinkle it on a salad. 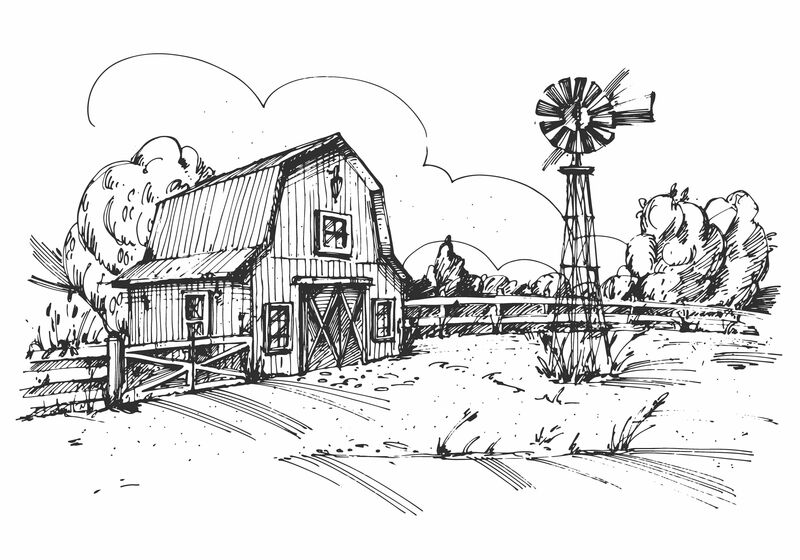 Only the ‘parmesan’ cheese produced in the Italian provinces of Parma, Reggio Emilia, Modena, Bologna (west of the Reno) and Mantua (south of the Po) can legally be labeled parmesan or parmigiano reggiano. Try the real thing from Italy that has been aged 24 months. It makes a big difference in how dishes taste. 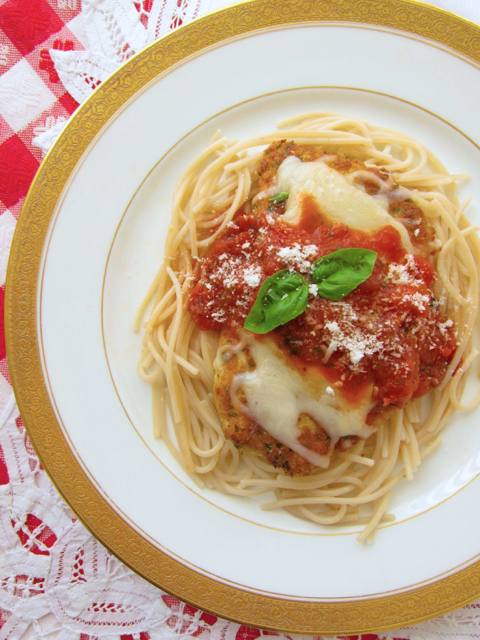 Traditionally chicken parmigiana is a baked dish. The meat is breaded and shallow or deep fried, then layered in a casserole with pasta sauce and cheese. To avoid having the crisp breading getting soggy, the recipe can be changed to doing the layering right on the plate as you serve it. You can mix some sauce with the pasta along with some parmesan cheese and put the chicken on top. Or put the chicken on the pasta and spoon the sauce on top. We have been told that cooked vegetables have less nutrition than fresh but in the case of tomatoes, we may get more form them cooked. While their vitamin C content is reduced by a small percentage, tomatoes are a good source of lycopene and this phytochemical that makes them red has highly efficient antioxidant properties (more than vitamin E) and the anti-cancer power is boosted when tomatoes are cooked. Chicken parmigiana is served with spaghetti but you can use any shape pasta you like – linguini, rigatoni, fusilli, penne. Brown rice and millet quinoa pastas now come in many shapes. Buckwheat pastas have a distinct taste that is not good with tomato sauces. 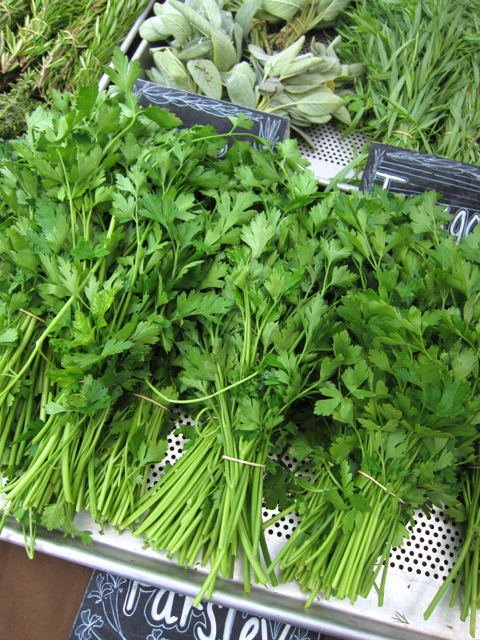 They are better for salads or warm herbed olive oil sauces. If you are on a low carb diet, try spaghetti squash or thinly sliced steamed green cabbage or vegetable noodles made with a spiral cutter. Cut chicken breasts diagonally through the middle to make four pieces. Place chicken in a plastic bag and pound to 1/2 inch thick, sprinkle both sides with salt and pepper. Process parmesan cheese, bread crumbs, garlic clove, oregano and parsley until they are even crumbs. Place flour on a plate, beaten egg on another plate, and cheese and breadcrumb mixture on a third plate. Dredge chicken in flour, then in egg and then lay on the crumbs, turn over and press. Lay chicken on paper towels on a plate and chill for 1 hour or more. Preheat oven to 350 degrees. Heat pasta sauce on medium low heat. Heat the oil in a sauté pan over medium high heat. When oil is hot, place chicken pieces, two at a time in hot oil and cook 3-4 minutes on each side. Place in a casserole, sprinkle with mozzarella cheese and bake until cheese melts. 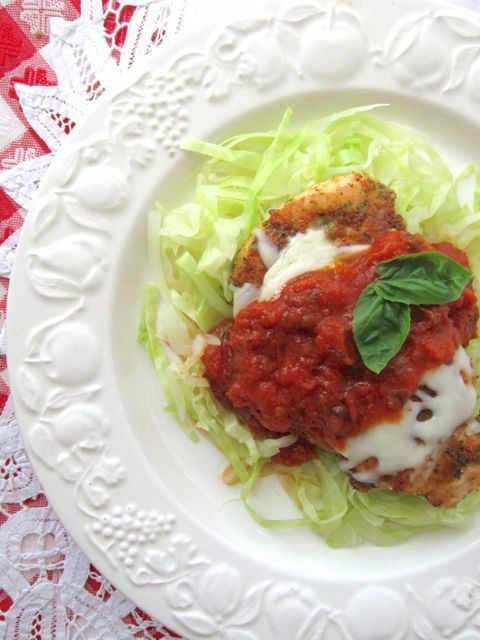 Place chicken on cooked pasta, baked spaghetti squash or steamed cabbage or vegetable noodles. 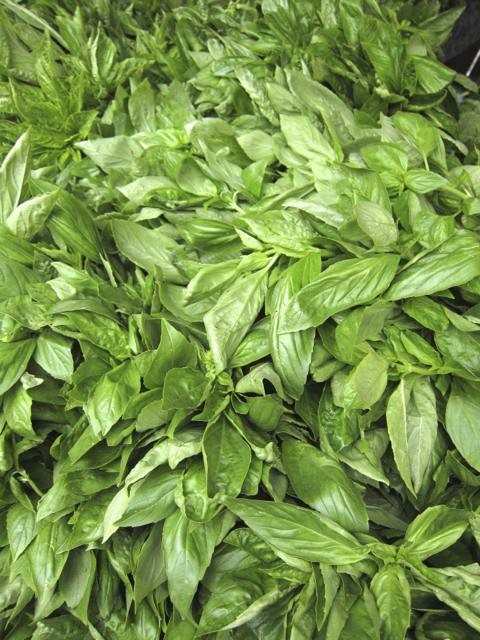 Spoon pasta sauce over the top and sprinkle with parmesan and decorate with fresh basil leaves. If you like a lot of basil, chop it and sprinkle it all over the dish. *I don’t use dry or toasted crumbs because I like the crust soft but if you spread the bread crumbs on a plate to dry for a little while, it makes it easier to bread the chicken. 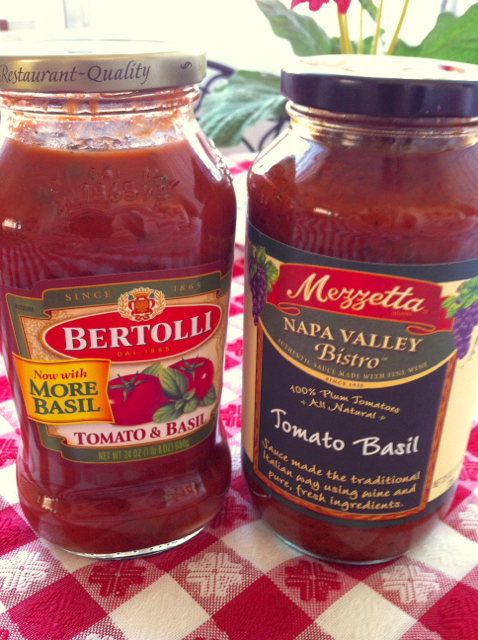 ***I like to mix a jar of Mezzetta Tomato Basil (it has wine and is very authentic tasting) and a jar of Bertolli Tomato Basil (Bertolli is a sweeter sauce).